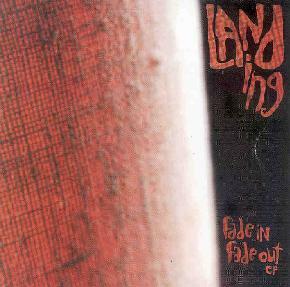 Landing - "Fade In Fade Out EP"
With Fade In/Fade Out, Connecticut space explorers Landing offer up their most cosmic outing to date. This 5 track EP is more along the lines of Oceanless than their other more song-oriented albums such as 2001's Circuit and this year's Seasons. Completely improvised, Fade In/Fade Out is a sonic journey through dark forests, along the shores of midnight oceans, beneath skies filled with endless stars. On Forest Ocean Sound, layers of sighing, echoing guitars float dreamily through spacey electronics, weaving mysterious melodies that suggest something bigger than all of us is out there. Softly melodic electric finger picking and washes of feedback obscure the distant singing and faint drumming on After the Rain. The beautiful Constellations features gentle acoustic guitar and the kind of rich, eerie space sounds that send shivers up your spine. Whirlwind settles into a swirling blend of guitars and electronics and again features subtle drumming, and the beautifully haunting voice of Adrienne Snow. Pulse rounds things out, with throbbing waves of feedback and a fuzzed out guitar lead that still somehow manages to remain calm and peaceful, never once detracting from the overall laidback feel of the album. I even found the length of the EP, clocking in at just under 38-minutes, to be perfect. Not too long to get boring, and just long enough to give you a satisfying voyage. Landing are perhaps inappropriately named, because this recording is definitely taking off to realms less than Earthbound. Highly recommended! Visit Landing at their web site: http://www.landingsite.net. Fade In Fade Out is distributed by Strange Attractors Audio House. You can visit their web site at: http://www.strange-attractors.com. Contact via snail mail c/o Strange Attractors Audio House; PO Box 13007; Portland, OR 97213-0007.